Mardi Gras is about more than beads and King Cake. There’s a lot of symbolism to the celebration, and it marks a day of fun before the reverence of Lent begins. There are a lot of different ways to incorporate Mardi Gras learning activities into your classroom, from crafts to reading books to learning a little French. Here are some activity ideas to get you started. JDaniel4sMom wrote a post about decorating masks, making a bra graph and using beads to make a Venn diagram (that’s my favorite!). 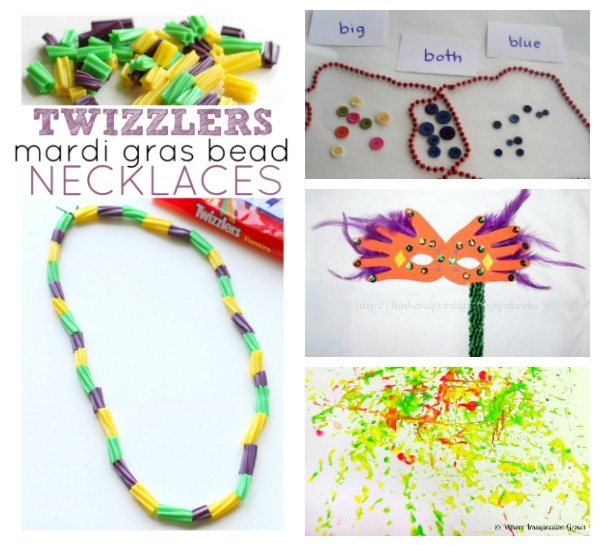 Kids Activities Blog has a great collection of Mardi Gras activities, including links to masks and crowns, recipes, a shoebox parade float and a lot more. Add a little Mardi Gras to your snack time with this “beaded” necklace made out of Twizzlers from No Time for Flash Cards. Elemeno-p Kids has a Mardi Gras printable pack with handwriting activities, counting, matching and more, as well as a fun collection of Mardi Gras books for preschoolers. Painting with Mardi Gras beads is a fun sensory experience and process art project. Where Imagination Grows shows you how. The Handprint Mardi Gras Mask from Fun Handprint Art is another fun choice for a mask project. Add beads and feathers or just draw on it. Learn more about how Mardi Gras is celebrated around the world, the religious meaning of the holiday and some fun ways to celebrate Mardi Gras in French class (or anywhere else) at the FluentU blog. Do you celebrate Mardi Gras with your kids? I’d love to hear about the activities you do!